Being outside this past weekend one would never know that the place was soggy from rain and snow a mere 7+ days before! As they say, what a difference a week makes. We had two gorgeous days in the 60s and 70s (almost reached 80 on Sunday!). And it was with the sun in mind that we packed our schedule full of outdoors chores. This included everything from mowing the grass to planting some early seeds. It also included the requisite bout of resulting allergies. Ick. They aren’t too bad yet, but based on the light sneezing and wheezing in our household over the past couple days, it’s a good sign that Spring allergies are certainly on their way. But enough about silly things like allergies — we had a garden that needed some more TLC! …had really just blossomed into weeds. So they had to go. However, most surprisingly, we did find a couple of carrots growing! 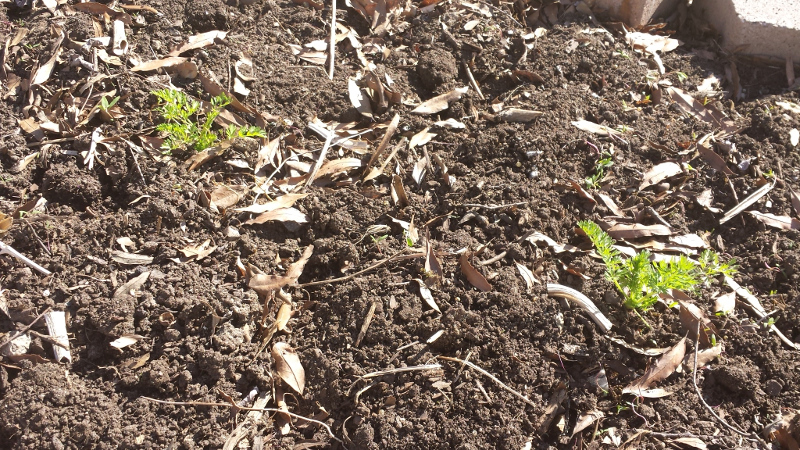 No plans to plant carrots this year, but we’ll see if these guys make it. And then, we had to deal with this stuff. This ivy-like weed is called many things — we had been calling it “dollar weed” — but we like the term “Creeping Charlie” better. 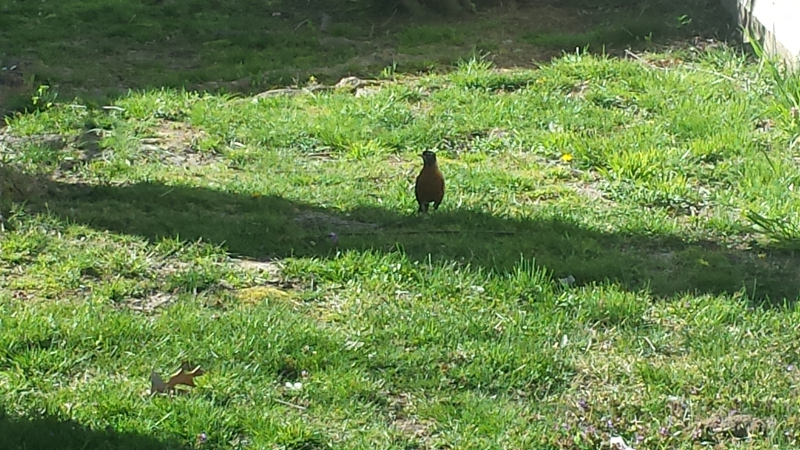 Not that it’s better; in fact, it’s is highly annoying, and it has all but taken over the backyard. 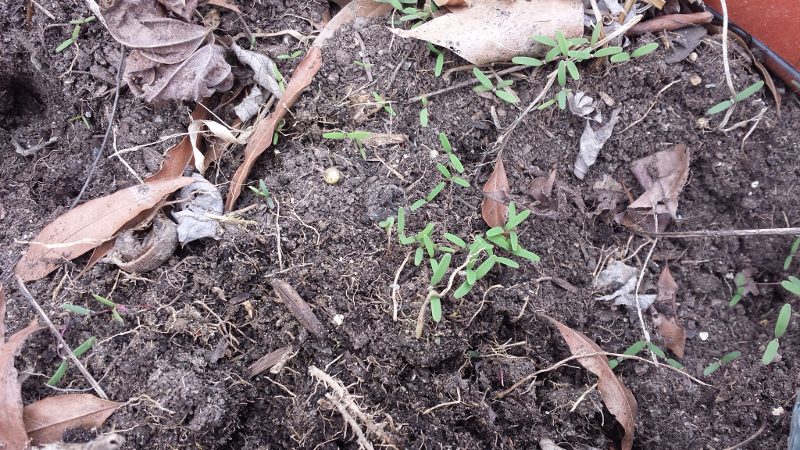 And before we got to weeding, it has started to creep into most of the garden bed. We pulled out as much as we could stand. After awhile its “minty” scent that it produced upon being yanked up proved to be too much, and we had to call it a day. Hopefully it’ll start to die back once the weather gets warmer and less damp. But as much as we got done well into the evening hours of Saturday (this included digging up and resetting a number of stones out in our front beds, as well. Oh! And moving/transplanting some lilies. Boy, we were busy! ), it was nothing compared to the banner day we had Sunday. 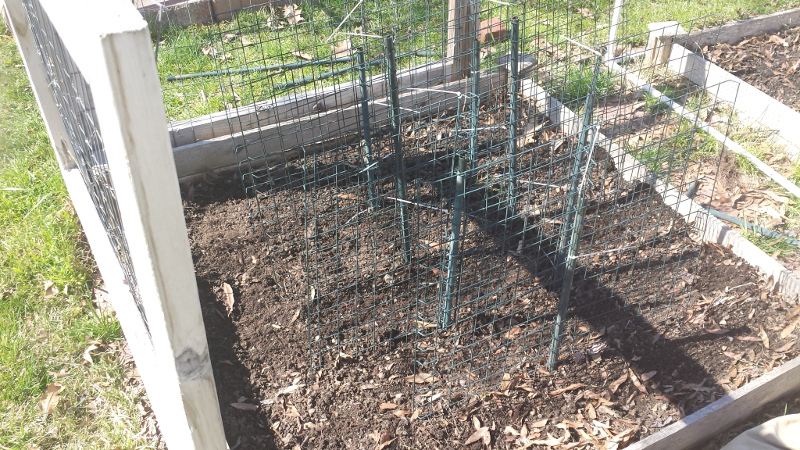 It was time to start some early seeds — mostly lettuce, greens, radishes, and we took a risk with peas and a couple peppers — which meant that we had to re-assemble our net cages. 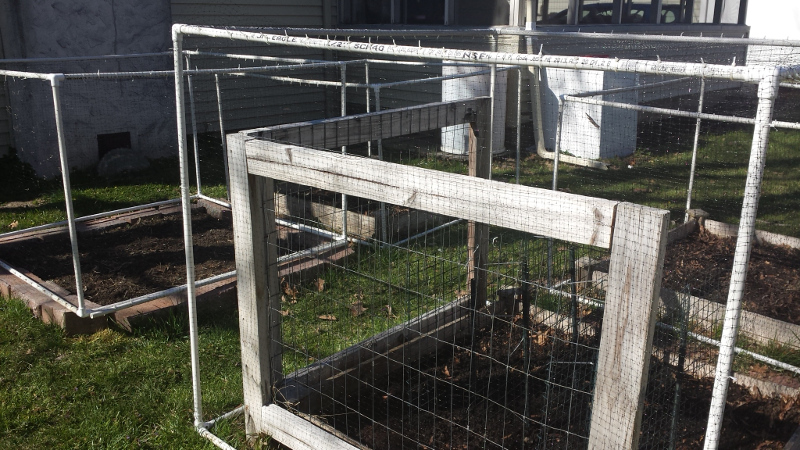 Last year we made four square-ish net cages to go over our raised bed. 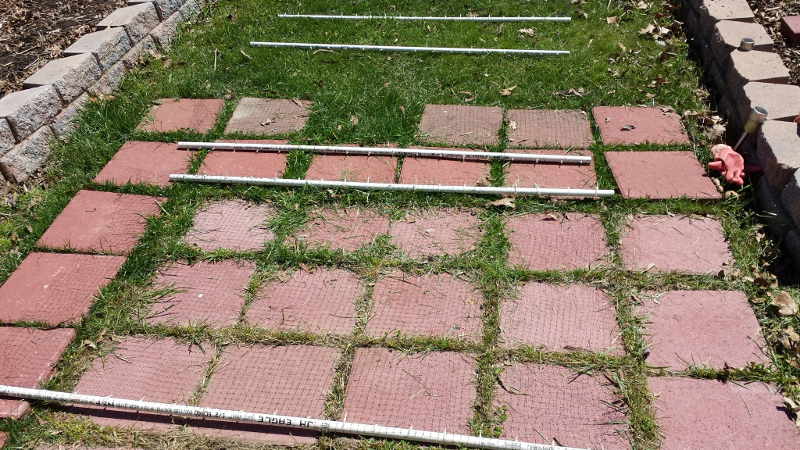 We made them in a way that they could be taken apart and rolled up over the winter. It was all quite grand until it came time to put them back together, which we couldn’t quite remember how to do, at first. As we hadn’t labeled which pieces when together to form which cage — we had two small ones, one large one, and one with a “door” to lift for easy access — getting them back together was puzzling at first. 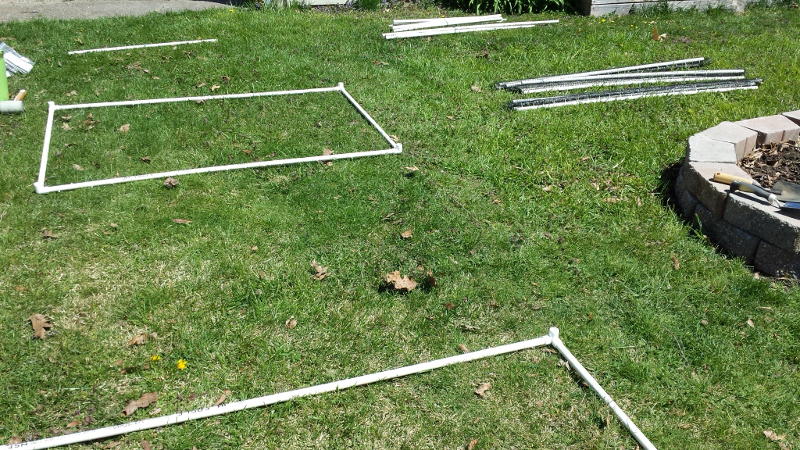 We eventually decided to simply lay all the pieces out in the yard to figure things out. 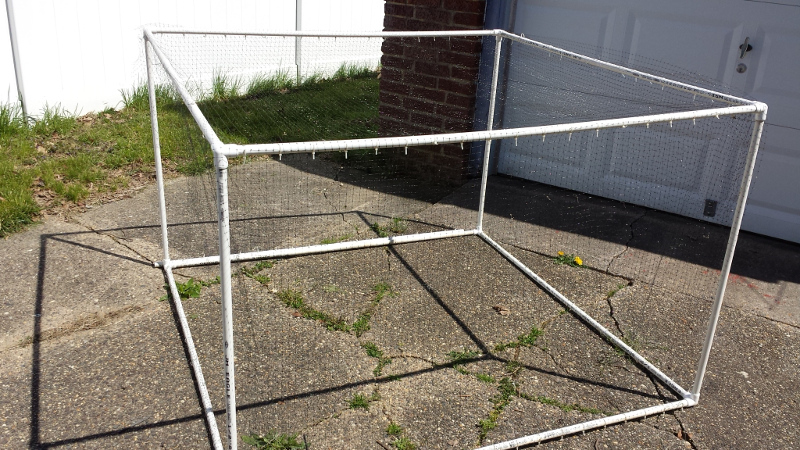 Once we remembered how to put one cage together properly, the rest were a snap. 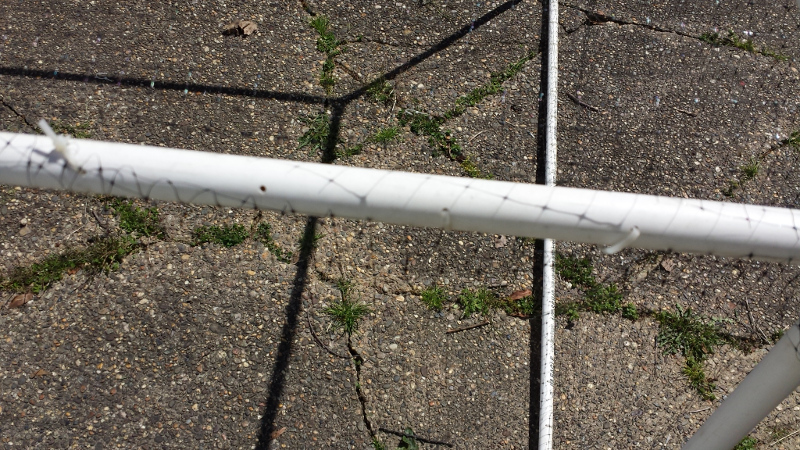 The only issue we faced were repairs, as a number of zip ties used to hold the net to the PVC pipe had cracked. 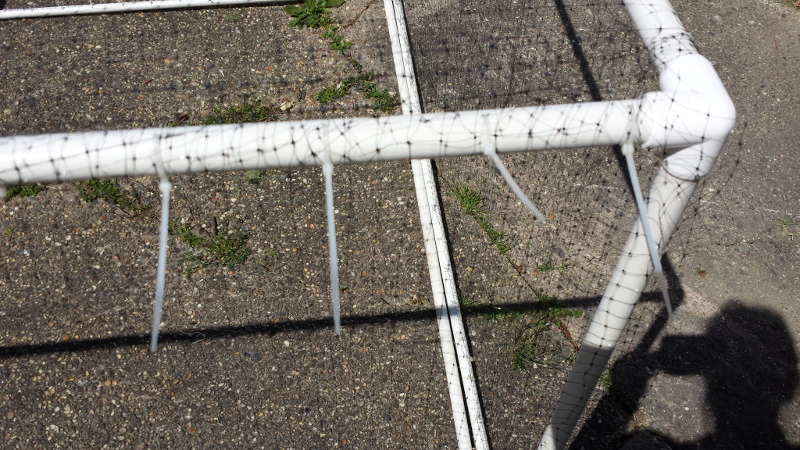 So each cage had to be moved to the driveway for inspection. First cage in line ready for inspection. …and replaced them with new ones. Simple if a little time consuming. Once all the cages had been checked and fixed, we placed them over their proper beds. Good to see the gang back together! Over the winter, the wood boards bordering the bed picture above collapsed and rotted. Rather than replace the boards, we decided to continue our “design” scheme that we had applied to our stone beds and picked up some landscaping stones to make a new border. The layout right now as seen in the image is rough. They might stay like that, we might dig them out a little to set them straighter, or might turn them up on their edges so that the cage fits better. Not sure yet what will happen, but the idea is that we’ll replace each raised bed with a stone border once the current wood borders deteriorate. The rest of the beds are fine for now. 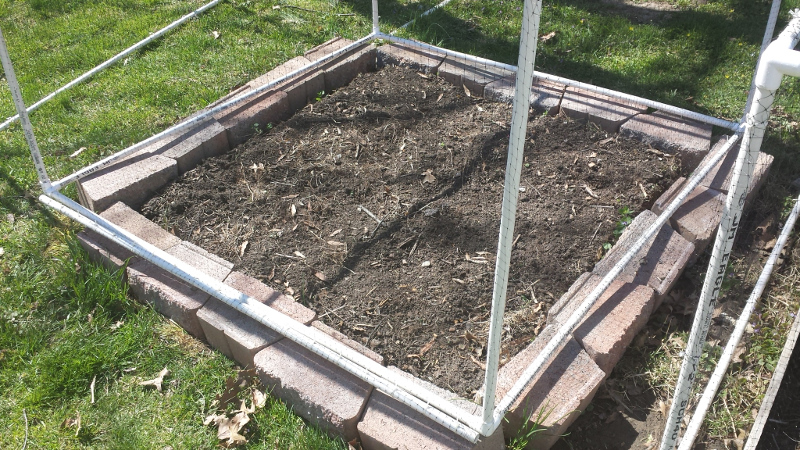 The other new “addition” are some small, makeshift trellises that we added to the bed in which we grow peas. These were made using a set of old wire shelves, some zip ties, and some metal poles. Nothing special but it works! And it means that we can now fill the bed with different peas rather than only planted the peas along the edges. And despite the fact that the nights will be a little on the cool side for a couple more weeks, at least, we went ahead with planting out the bed. All in all, it was an excellent weekend, even if it resulted in muscle pain and allergies. And there’s plenty yet to be done! Previous Article If April Showers Bring May Flowers, What Do April Snow Showers Bring? And don’t forget Alfalfa for your spring allergies!